We spent this weekend at a family celebration in New Jersey and then drove up to New York City for some museum hopping, especially the Delacroix exhibition. We stayed on the upper west side and walked across Central Park on Monday morning. 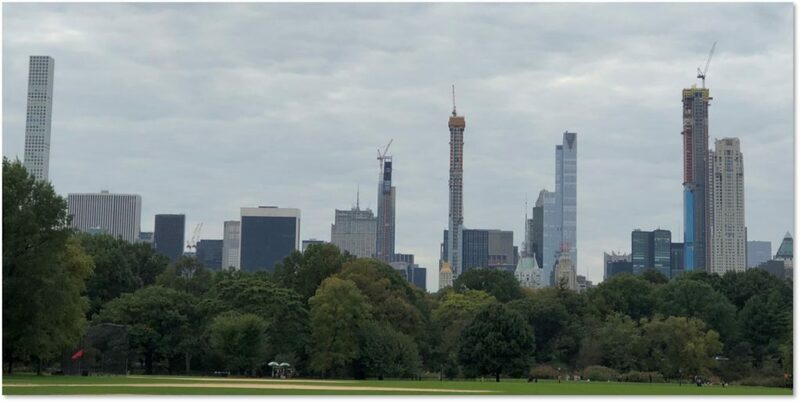 That gave us a good view of the new “supertall skyscrapers” that are going up as residences on Central Park South. While these structures are certainly impressive, I don’t think I would want to live in one, even if I could afford it. Each of these tall, slender buildings must have at least two and probably more sets of tuned mass dampers to keep residents at the top from becoming seasick in a high wind. Even so, these skyscrapers sway: they have to. The swaying makes them groan. When I worked for an architectural/engineering firm at 345 Park Avenue, my desk butted up to a wall on the other side of which was a major structural beam. On windy days it creaked and groaned so much I felt like I was on a tall ship far out in the ocean—and I was only on the third floor. Plus, you may live “above the clouds” but those clouds can get in your way when you want a view of the world below. Being that high up also puts you out of range of firetrucks in case of a blaze. And you don’t want to think about getting home in a blackout when you live on the 95th floor. On Manhattan’s east side, we went first stop to the Neue Galerie on Fifth Avenue to see Gustav Klimt’s “Portrait of Adele Bloch Bauer I.” The portrait has a past—stolen by Nazis, revered in Vienna, and finally recovered by the family. 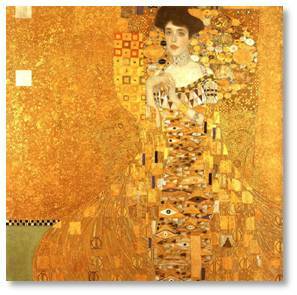 I discussed it in a previous post about the movie, Woman in Gold, which tells the story in riveting detail. Revlon heir Ronald Lauder established The Neue Galerie to display early twentieth-century German and Austrian art and design. While this period does not make my Top 10 list, I did want to see the painting, now that it has found a home in the United States. We made our way past the Egon Schiele works—I really dislike his emaciated figures and cadaverous palate—and into the Klimt room. There we saw many beautiful portraits and landscapes. The 1907 Portrait of Adele Bloch-Bauer I commanded the east wall. I sat and examined it for a long time, exploring the swirling forms, golden shapes, lapis rectangles, and—finally—the woman’s face and hands. This painting has been reproduced in so many forms, from refrigerator magnets to scarves, that I imagine it in terms of those vivid, glittering gold colors. To my surprise, the painting itself was far more subdued. Still, it did not disappoint. Next, we went upstairs to the current exhibition of works by Franz Marc and August Macke. This offered a great opportunity to see how the work of these two friends grew in depth and color. Franz Marc, especially, went from pastel paintings of animals in a very naturalistic style to abstract works in vivid colors. August Macke, on the other hand, retained his intense palate of saturated colors as he progressed to more abstract work. It’s anyone’s guess what their later art would have looked like as both men died young in World War I. We could have ordered Viennese coffee and pastry in the Galerie’s Café Sabarsky but we were still full from our enormous breakfast at the Manhattan Diner. Instead, we strolled one block down Fifth Avenue to the Metropolitan Museum of Art. There, we took in the Delacroix exhibit, on display through January 6, 2019. 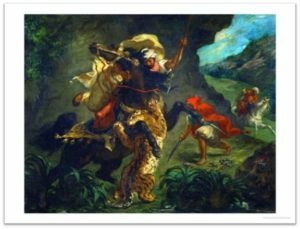 One of the most comprehensive collections of one artist’s work I have ever seen, the Delacroix exhibition includes 150 paintings, drawings, illustrations, prints and manuscripts. Be aware that it goes on for room after room and takes both time and stamina to complete. Wear comfortable shoes and sit down now and then. I always check the signage to see where the art works in an exhibition like this originated and most of the pieces in this joint project with the Louvre come from both museums Many of these works have never before been seen in the United States. If you prefer quiet still life paintings and staid landscapes, don’t come to see Delacroix. His work appeals to people who like action and drama. The exhibition is filled with enormous paintings of animals, battles, religious scenes, and “Orientalist” views of the Arab world. Dynamic horses, fierce lions and tigers (yes, even two bears, oh my), fill the canvases that often take up a whole wall. Delacroix’s work is also characterized by vivid color and swirling compositions. Viewing this exhibition felt like a tumultuous experience. It was also a tiring one. Two museums in one day left us foot-sore and weary. We left The Met as it closed and, after one restorative hot dog apiece from the street cart, took a cab back to our hotel. We left the next day, but not before stocking up on sour pickles from The Pickle Guys and bialys from Kossar’s on the Lower East Side. Like Las Vegas, I can take New York City for only a few days before it gets to me. I’m always taken aback by the crowds, the noise, the dirt, the smells, and the enormity of it all. Those are all reasons I wanted to leave after four years of being a Noo Yawkuh. Now I’m home and appreciate my green and quiet surroundings. Until next time. This entry was posted in Art and Museums and tagged Adele Bloch-Bauer, August Macke, Egon Schiele, Eugene Delecroix, Franz Mark, Gustav Klimt, Kossar's, Manhattan Diner, New York City, The Louvre, The Metropolitan Museum of Art, The Neue Gallery, The Pickle Guys by Aline Kaplan. Bookmark the permalink.